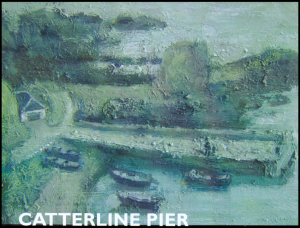 The road used for the Catterline Cartie Challenge was severely damaged by storms in 2012 and has not yet been repaired, so it is currently not possible to run the event. 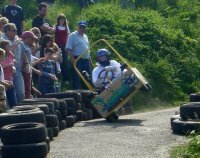 The Catterline Cartie Challenge was an annual competition for home made "gravity powered" soapbox carties which is held as part of Catterline Gala Weekend. It was first held in 2005, and is now one of the highlights of the village year. It is now also part of the Scottish Cartie Association Championship. The Cartie Challenge takes place on the Sunday after the Gala. The carties are time trialed down the brae from the Creel Inn to the harbour in a breathtaking display of skill, passion and nerves, with the winner being presented with the Connons Shield and hailed as the "Supreme Champion". There are also prizes for the Constructors Trophy for the best aggregate time and a "Champagne Moment" for the most memorable incident of the day. We have a number of places and they will be allocated on a strictly "first come, first served" basis, so you'll need to get your entry in as soon as possible to avoid disappointment. If you would prefer to just watch, then you are welcome to come along to inspect the carties at the Gala on Saturday afternoon and to watch the time trials on Sunday afternoon. If you are coming on Sunday, please have a look at our "Notes for Spectators" and in particular note the areas where you can stand. For safety reasons we cannot allow anyone on or beside the course while the time trials are taking place except for certain specified areas. If you have any questions or would like any further information, please send us an email. All money raised by the Cartie Challenge goes to the Gala Fund, which is used to support projects which benefit the local community. Submitted by stephen on June 28, 2006 - 21:06.